Sunday 14th May, 2017 - One of the Lawn Tennis Association's - Great British Tennis Weekend. 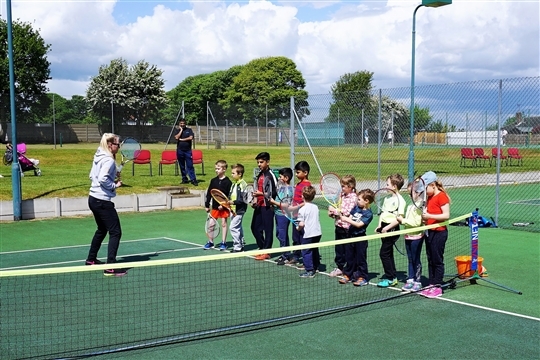 Mansfield Lawn Tennis Club held their most successful open day since 2013 - the year Andy Murray first triumphed in Wimbledon. The open day was attended by just short of 100 people with both children and adults alike enjoying taster sessions. The sun shone (mostly) and MLTC committee and club members were on hand to welcome visitors to the open day. There was also a BBQ, home-made cakes and a tombola to complete the day. The open day built on the club's successful application for funding from Sport Nottinghamshire to commence a satellite tennis club at the Brunts Academy. Satellite clubs are being promoted to encourage young people to take the step from school sport into a community sports club and continue playing sport long-term. We are one of only two tennis clubs in the area with full satellite funding.